Kurtis are among the most favoured ethic wears and can be found in every girl’s wardrobe these days. With the designers changing the ethnic wear scenario and coming up with new and fresh designs every now and then, kurtis are no more about simple and boring cut and monotonous designs. You can now find kurtis in a wide variety of classic cuts, materials, and fabric that can be worn at almost every occasion – be it formal or informal. Full-length kurtis with flare add drama to an evening or daytime party and thus are highly preferred for such occasions. Styles such as anarkali, princess cut, and double layered kurtis are perfect for special occasions and can be availed in materials such as silk, georgette, cotton, linen, etc. Pair them with a matching or contrasting dupatta along with heels or stilettos and you are ready for the party. Knee-length kurtis are perfect for everyday wear as one always looks out for something comfortable that can be worn throughout the day without any hassle. Being simplistic in design and appearance, these can be availed in a wide range of prints and designs which are a mix of contemporary and traditional. These are especially great for the college-going girls and affordable too. Some of the major ethnic wear brands such as Biba, Aurelia, Anahi, and more have an amazing collection of the knee-length kurtis which are perfect for everyday wear. You can check them out for taking a glance through their products. One of the advantages with the knee-length kurti is that it can be worn with jeans or jeggings apart from leggings if you want an indo-western look. The full length kurtis are more inclined towards the traditional style and are perfect for more elaborative occasions. Knee-length kurtis on the other hand look more casual. Thus, for days when you feel like something that is a perfect amalgamation of the two worlds, then go for the knee length kurtis in classic cuts. For those who have short height, full length kurtis with flare might prove to be a bit cumbersome and in such as circumstance, it is recommended that you wear stilettos so that the look of the outfit comes out beautifully. Knee-length kurtis are perfect for girls with any height and go well with the flats which make them a comfortable piece of clothing to wear on an everyday basis. Also, when it comes to design, you can choose cuts that would go well with your body type so that they do not look too baudy or out of shape when you wear them. Consider the points listed above whenever you are confused between the kurti lengths that would be perfect for a particular occasion. However, it is recommended that you own both of these varieties in your wardrobe so that you can wear them alternatively. Both of these have different styles which are perfect to make a style statement. 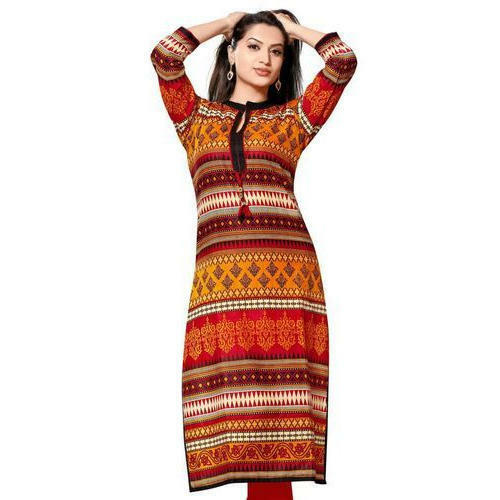 You can also check out https://www.gofynd.com/women/ethnic-wear/kurta-kurtis-anarkalis/kurtis to take a look at some of the most amazing design in kurtis that would make you want for more.